Have you ever wondered what kind of dog John Constantine would be? Or maybe Hellboy (though we all know it would probably be a pitbull)? The answer would look a lot like Beasts of Burden. Originally launched from Dark Horse in 2003, the dog-centred occult mystery team, also known as the all Scooby Scooby-Doo, has been weaving in and out of the expanded DH universe for almost 15 years. The team has not only appeared in stand-alone and mini-series format, but in various universe collections, even teaming up with Hellboy himself. The newest addition, Wise Dogs and Eldritch Men, sends our team to the Pocono Mountains in Pennsylvania, for a routine investigation gone very, very strange. A bit slow going at first, the comic picks up into a fun and mysterious romp about the creatures that dwell right under out feet. The overall premise for Beasts of Burden is a group of dogs and one cat who solve mysterious mysteries that plague their town of Burden Hill. During various expeditions, they frequently find themselves consulting with a group of shaman-like dogs called the Wise Dogs. This is the story of the Wise Dogs and the Eldritch Men. 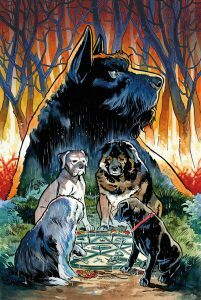 In the first issue, the Wise Dogs are called to investigate a fire in Pocono Mountains, with the wisest, a Scottie named Lundy, discovering the cause to be a trapped fire lizard with his leg caught in a steel trap. Lundy frees him only to notice that the creature wasn’t stuck in any trap, but one specifically designed to catch magical entities. Seems another mystery is a foot for the Wise Dogs, one that only grows deeper when the most reckless of the group, an American Bulldog named Dempsey, accidentally sets something free in the woods. With clashing personalities and personal demons, can the team get it together in time to solve the mystery of the monster hunters or will they be the next on the magical chopping block? This is a bit of an odd book to start with if you haven’t picked up a Beasts of Burden book before. While most of the comics focus on the original team, this one starts with the Wise Dogs, who have magical powers and seemingly know everything about the esoteric world while doing a couple throwbacks to the other crew. I would suggest picking up one of the earlier mini-series before diving full-fledged into this one (of course, you should read them anyway because they’re great). Also, the comic does have a bit of a pacing issue. It starts off strong with Lundy and the lizard, slows down for ten or so pages as they discuss the game plan/bicker, then end strong. The middle part really becomes a bit of a slog and suffers from talking head syndrome, making the reader wish they would just get to the point. Luckily the dogs are cute. 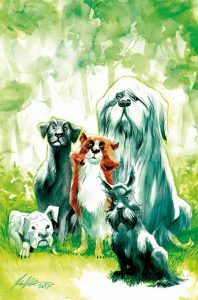 Aside from the complaints, if you’re a fan of the Beasts of Burden series, or just really into anything Evan Dorkin and Jill Thompson do, then you’re going to like it. The mystery is actually pretty fun and wonderfully spooky and with the title, you know it’s going to be something epically Lovecraftian. The characters are manage to stand out on their own without overshadowing anyone else, though it helps that they are all different breeds. Personally though, my favourite part of the comic is Jill Thompson art. Known for her soft watercolours and ink brush art style, she fills the book with beautiful pieces ranging from panel layouts and cluttered spaces to open style, flash pages. It’s more like flipping through an art book than a real comic and makes for a surprisingly immersive read that gently moves the readers eyes from one panel to the next. Luckily, unlike many fine-artists-turned-illustrators, there’s none of the transitional hiccups or jarring character movements that tend to plague the work of others who haphazardly thought that since they could paint, they could do comics, but a very precise work that mixes the two mediums beautifully. Both mediums require different skills and Thompson has managed to master them both, making a comic that visually stands head and shoulders over the competition. If you’re interested in seeing some of this fantastic artwork while catching up on your favourite magical dog team, check out Beasts of Burden: Wise Dogs and Eldritch Men #1 hitting stores on 22nd August!